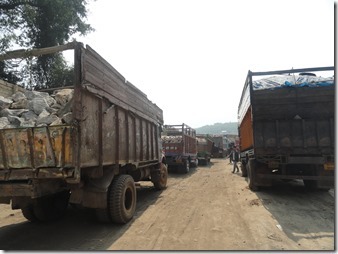 Eight hundred dumper trucks filled to the brim with coal and limestone stand on the Indian side, patiently waiting to cross the border into Bangladesh and dump their load. That’s all they do, day in and day out. 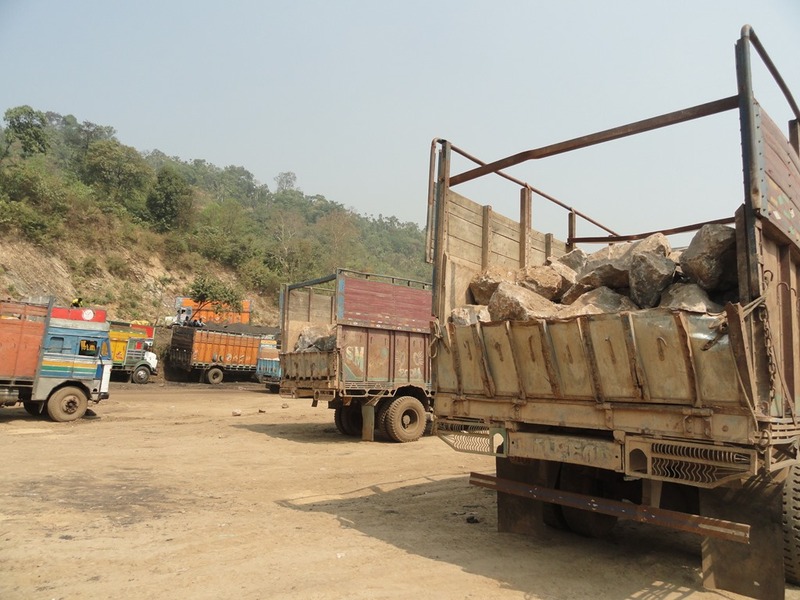 Pick up limestone and coal, dug out from the mountains of Meghalaya, head to the border at Dawki, cross into Bangladesh and dump it there. To be exported to China or be made into cement. Who knows? Who cares? 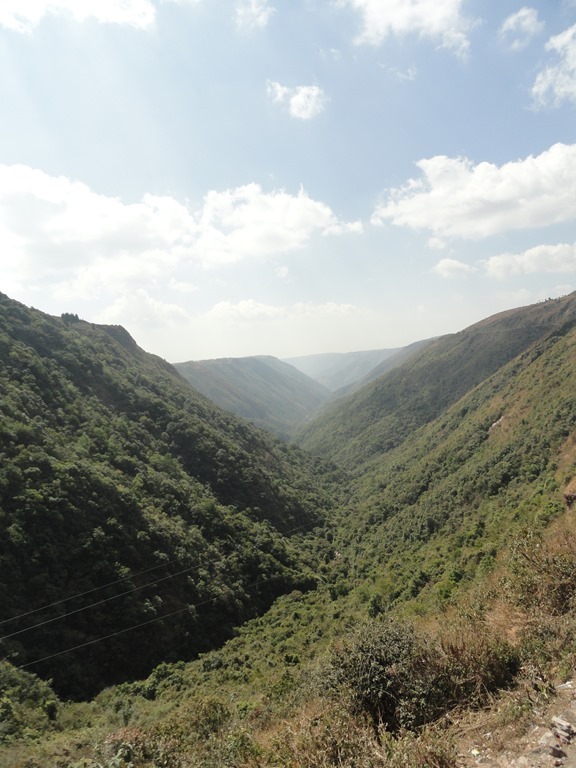 The politicians, the landowners, the people of Meghalaya are making money. They are beginning to buy bigger cars and other good things in life. 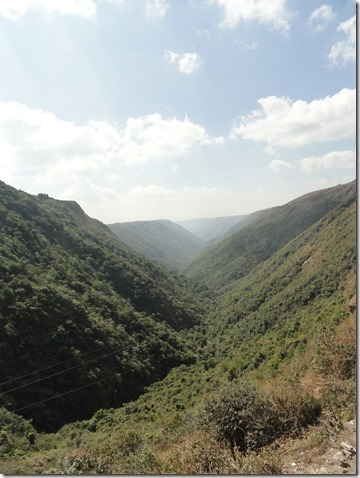 The mountains of Meghalaya, are old, more ancient and wiser, more mysterious but also kinder than Himalayas. Perhaps that is why they do not protest to being drilled, cut, stripped of their soil and stone. Maybe because it’s all legal: as in each truckload is given a wadload of paper, stamped by the government. Papers, dead trees license the owners to cut and grab and gobble. By selling the land, the guide means, mining it away, selling the raw materials that might be lying in the womb of the mountains, that had been created and took hundreds of years to be created. All to be gone, in twenty years of senseless human greed. After that, a few men from Maharashtra, whose guide we have been speaking to, mutter about politicians and rich people and their greedy hearts. Their tea is finished. They try to throw the plastic cup across into the valley, but we point to a dustbin. The mountains, standing infront, look at it all, at us with our meaningless conversations as tourists who are equally disruptive on their ecology, at the trucks that roll heavy over them filled with stolen chunks of them and remain silent, patient. How can someone own the mountains? But then, how can we own anything of the land? But we do, don’t we? At the border, at Dawki, the roads are mere trails of mud covered with long lines of trucks filled to the brim, waiting to cross the border and an equally long line coming from Bangladesh emptied of their load. We walk through the slush, dust clinging to everything. There are no tourists here, only silent eyes of men, labourers, or truck drivers. On our side, a long series of huts, with chairs and tables and typewriters and printers. To make the stealing official. To give it a seal, the seal of India’s government. To show, to cry out, to the mountains perhaps, that it’s all legal. That they’re all good men. We are hesitant, even afraid, not sure how far we can walk. after all, the tourist stays in similar spaces, with other tourists. This is not that space. This is business, this is industry, this is supposed to stay hidden in dusts. The border ends in a valley. 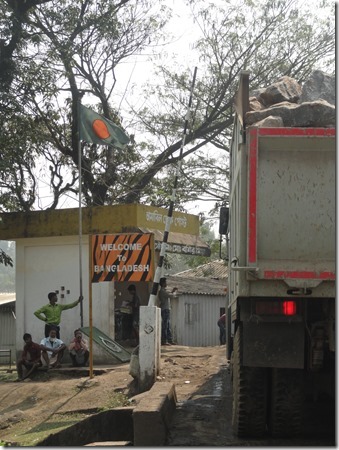 A gate at one side, welcoming people to Bangladesh. We stand at ‘our’ side. The policeman in the hut, looks up. 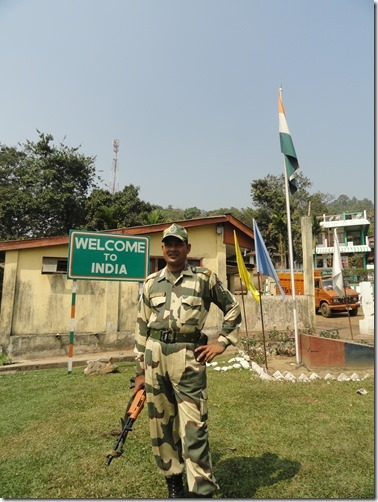 ‘Ok,’ he says, to our surprise asking the BSF fellow with a gleaming, polished gun to show us the ‘border’. The BSF jawan is helpful, from UP, and waiting for just such an opportunity to jabber. He tells us how people across the border wait, day in day out, young men to cross the border. 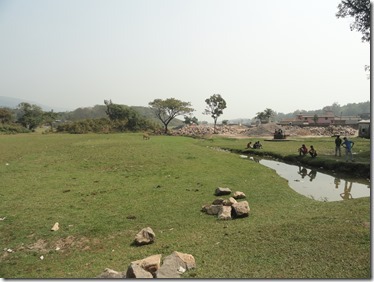 Cows graze in the flatland between the two countries, moving seamlessly from one side to another. No passports required for them, unlike us. A family from Bangladesh with a suitcase approaches the Indian side. Tourists, we are informed. ‘You can also go to the other side. It’s visa on arrival for both the countries,’ says the BSF guard. We, the city people, crib about how the government is mining the mountains away and no one seems to care. ‘The government is too greedy. 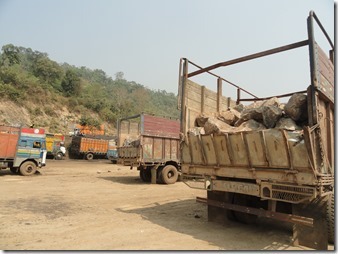 they can make cement here, in Meghalaya, give work to more people, but they dig and sell the motherland away in peanuts. 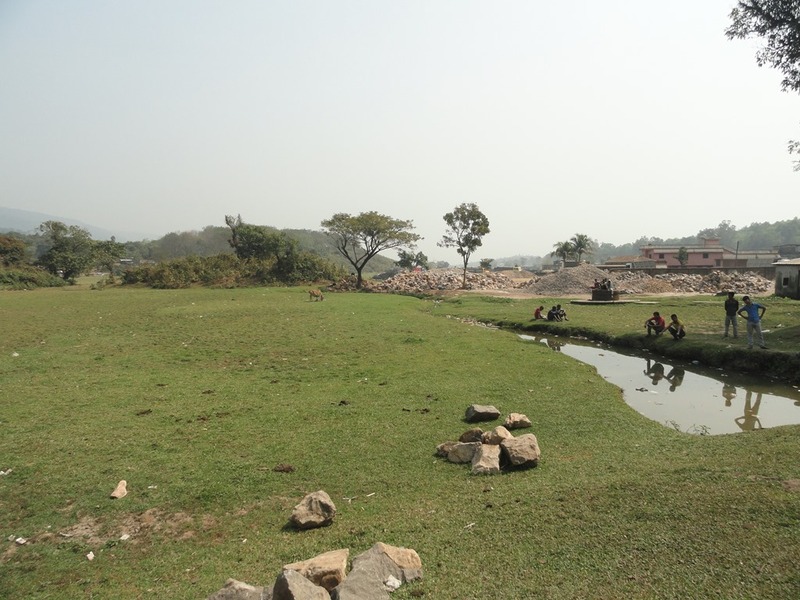 From Bangladesh it goes to China, the raw material, the earth. Why don’t they make cement here? She’s our mother, but no one cares about the mother now,’ he says wisely. ‘They don’t understand that we will lose the vantage point, the height of the mountains. Then they will attack and enslave us all. You see, madam, in a generation, we will be desperate to enter their country like the Bangladeshis want to enter ours now.’ We nod, and see and click pictures refusing to shrug off the tourist in us. He poses for us, still proud of his country. Not the people, but the country—his mother. He’s been trained to be proud. Back in Shillong, my heart is still somewhat heavy. Even the lovely cottage I stay in, doesn’t cut it. I chat with the owner of the cottage, a lady who lives in Shillong and Bangalore. Me, with my privileged outlook, do not understand why. Why do those with trees and mountains and fresh air want to sell it off? Not hoard it, make love to it, cherish it. A college-dropout from Manipur, who meets me in the airplane back home, gives me the answer. ‘We want development,’ he says. He cannot express it but when he talks about Bangalore, a city of malls, traffic, people, energy, colour, human bustling, his eyes shine. For him, from Manipur, from Imphal, from the quiet mountains, the city life is the lure. He craves for that, just like me. I have lived in cities all my life and I love it. Can I live in Dawki? I don’t think I can. But I do dream of mountains and greenery and forests and trees. And a part of me wonders if we, the human race, with our greedy cravings, are going terribly wrong, somewhere. So here’s a poem to perhaps express what my sentences could not. Perhaps not. But the desire to own. I do hope this blog, somehow, somewhere, shows me or someone else a way to somehow stop it. With some hope.